It's time for the big one. Congenitally Corrected Transposition of the Great Arteries (ccTGA, LTGA). In normal, healthy heart there are 4 chambers. Two upper chambers called atria and two lower chambers called ventricles. 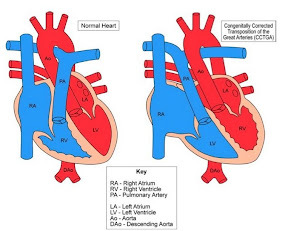 There is a Right Atrium (RA) that empties to the Right Ventricle (RV), allowing oxygen depleted blood coming back from the body to be delivered to lungs through Pulmonary Artery (PA) arising from the Right Ventricle (RV). Then, through the Pulmonary Veins blood comes back to the Left Atrium (LA) that empties to the Left Ventricle (LV) through the Mitral Valve and then the oxygenated blood goes out to the body through Aorta (AO) arising from the Right Ventricle (RV). In case of Congenitally Corrected Transposition of the Great Arteries (ccTGA or also called LTGA for Levo Transposition of the Great Arteries) there is an atrioventricular discordance and ventriculoarterial discordance (AV and VA discordance), meaning the Right Atrium (RA) empties to morphological Left Ventricle (LV) through Mitral Valve, from which arises Pulmonary Artery (PA) providing deoxygenated blood (blue) to the lungs. Then the oxygenated (red) blood comes back through Pulmonary Veins to the Left Atrium (LA) and through Tricuspid Valve empties to morphological Right Ventricle (RV) from which Aorta (AO) arises distributing blood to the body. As you see, both ventricles are switched performing roles they have not been designed for, but due to both main arteries (Pulmonary Artery and Aorta) arising from incorrect ventricles, the correct blood flow through incorrect path is provided. The data shows that about 20% of children born with LTGA is also born with heart on the right side of the body (not left). This is called dextrocardia. If this is the only defect, surgery may not be required and children with LTGA may potentially live long, normal lives without the need for surgical correction. They remain under regular care of their cardiologist though, who needs to monitor the heart's condition, since the Right Ventricle (RV), being designed to work under much lower pressure, is now pumping blood to the body, working under approximately 3 times higher pressure. This poses a risk of blood regurgitation through the Tricuspid Valve, weakening of the heart and Complete Heart Block (CHB), in which the contractions of upper and lower chambers are not in synchrony and there may be a need for a pacemaker. The risk of CHB increases 1%-2% each year. In case a corrective surgery is needed (due to other defects, or to simply correct the defect and increase chance for long healthy life) a Double Switch (DS) surgery may be performed. There are different variations of Double Switch; Mustard or Senning. In Abi's case it was Senning procedure.